There are many places to dive in the world, with the types of diving as diverse as the locations. What makes scuba diving Key Largo unique is the variety of choices and the ease of getting there. A major draw for the Key Largo reefs is the shallow depths, where a diver can get a full hour of bottom time studying the largest variety of fish species anywhere in the Caribbean. Divers can video tape or take underwater photography of the abundance of sea life in Key Largo. For the novice diver there is no better place in the world to polish scuba dive skills, while enjoying the beauty and splendor of Key Largo's reefs and shallow wrecks. For the more intrepid tech diver, Key Largo Florida offers the USCG Cutters Duane & Bibb, and the USS Spiegel Grove. At the intermediate depths of 60ft to 140ft, these wrecks will definitely satisfy that mystical "lust for rust". Become a Scuba Instructor! Key Largo, FL 85Â°F Clear Hour-by-hour | 10-day Horizon Divers â€” the shop with whom to go scuba diving Key Largo Florida â€” is committed to the safety, comfort and enjoyment of our guests which is why our divers and snorkelers always return for more, bringing friends and family along. Horizon Divers is in the heart of Key Largo, Florida. 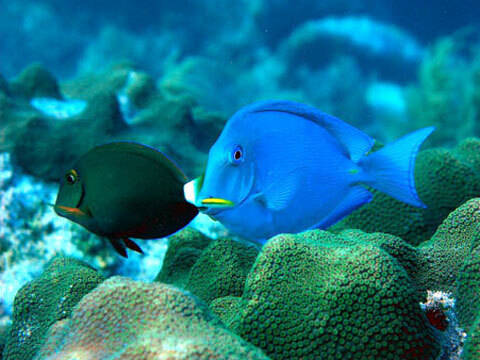 We are a short boat cruise to Key Largo's 100 beautiful dive sites. That means you're in the water more than in the car or on the boat. We are a full service PADI, TDI and IANTD dive center providing an array of standard and unique amenities, not just exceptional Upper Florida Key scuba diving and Key Largo snorkeling. Those amenities begin with iced fruit juices and water on every Key Largo dive trip; freshwater rinse stations on board; spacious, clean and air conditioned scuba dive classroom; wireless internet access; special rates on Key Largo lodging; guest gear pick-up/storage/shipping service; shoreside barbecues; Key Largo party cruises and more.